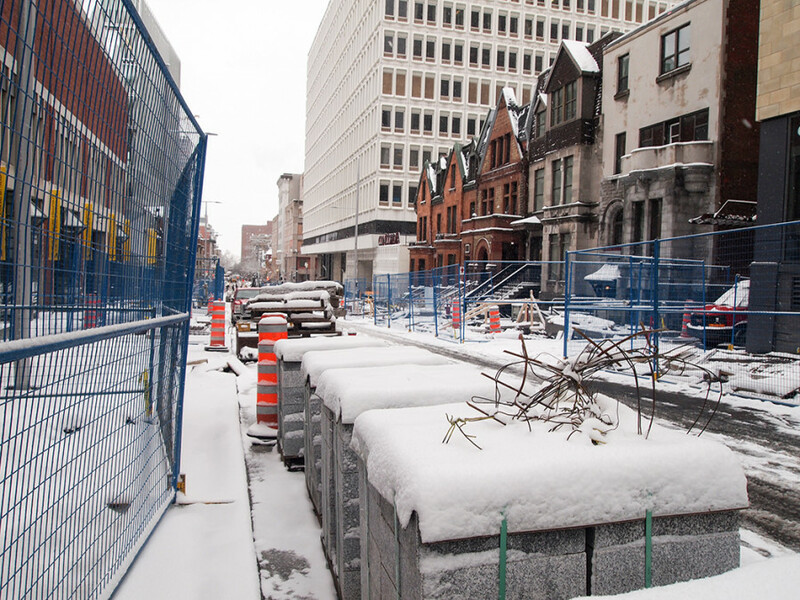 While today marks November 2016’s first snowfall, the construction on Bishop St. next to Concordia’s Hall building downtown is still going strong. The construction has been problematic for many of the businesses on Bishop St., like the Concordia Co-op Bookstore and Misoya Restaurant. Blocked sidewalks, big holes in the street and heavy machinery have also been dangerous for passersby. Larissa Dutil, the co-manager of the bookstore, said employees can hear construction from outside during their shifts. “It’s obviously affecting foot traffic in the sense that the sidewalk is either partially or completely blocked from de Maisonneuve [Blvd.] going towards Sherbrooke [St.],” she said. Dutil added that some bookstore employees were subject to cat calls from construction workers while on their way to work, and that the water in the building has been shut off multiple times. Owner of Misoya Restaurant, Kayoko Rousseau, said two to three restaurants on Bishop St. closed, and that businesses on the street have been affected quite a bit. “Two weeks ago, they shut down the sidewalk and the police came, and they told us that we cannot run the business because it’s too dangerous for customers to come down,” Rousseau said near the beginning of November. The restaurant was only accessible by a wooden plank crossing a big hole in the sidewalk for much of the time since construction began. The ultimate goal is to turn Bishop St. into a cultural education zone. The project is a collaboration between the Museum of Fine Arts, Concordia University, and the City of Montreal. Bishop St. will be turned into a walking space that will showcase the “transformation of urban infrastructure,” according to a press release from City representative Philippe Sabourin. The redevelopment is also meant to bolster the cultural identity of the area. City of Montreal representatives have repeatedly said that infrastructure construction on Bishop St. will be finished by fall 2016. 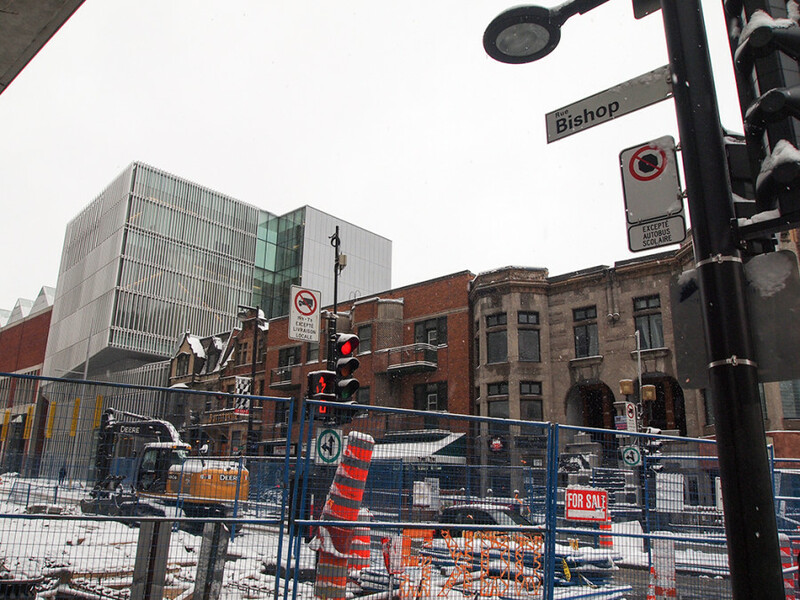 But “surface management” work on the cultural education zone will persist until the spring, according to City representative Jacques-Alain Lavallée. This work will involve redesign and urban planning of the new walking space. The Bishop St. entrance to the Hall building has been blocked due to construction since Sept. 19, according to Concordia’s website. It was supposed to be accessible to students on Nov. 18, but for the time being access has not opened up. Furthermore, the Mackay St. entrance was expected to be blocked starting today, Nov. 21, for unknown reasons. It is still fully accessible. Some people are angry at the construction, like Susan Raymer, who tripped on two bolts on De Maisonneuve Blvd. near Bishop St. that were left behind from a bench that had been removed. Raymer’s head began to bleed, and she was quickly ushered to the Montreal General Hospital. In a letter to The Link published on Nov. 8, Raymer warned walkers to be careful of the effects of the construction work, and criticized the City of Montreal workers who left four unmarked bolts embedded in the sidewalk. These events took place before the snow and slush came. If the City lives up to its original deadline, construction should be finished by Dec. 21, the first day of winter.